The Keynote Speaker’s Early Influence Award was given to Saakshi Kale ‘19 for her work entitled, “The State and the Citizen: From Ancient Greek and Indian Philosophy to Contemporary Society.” Kale received the award, sponsored by the English and journalism department, due to the social importance of her research and the impact it will have on society. Kale is from Mumbai, Maharashtra, India, and is a psychology major, with minors in philosophy and anthropology. Erica Bien ‘20 was given the award for Interdisciplinary Research and Collaboration for her work entitled, “Loss of β1-Integrin Disrupts Signal Transduction Required for Smooth Muscle Contraction in Mouse Bladder.” This award is given to a student who has done research that involves more than one academic discipline and/or that requires collaboration between multiple parties. Bien demonstrated a keen ability to synthesize ideas and concepts from multiple disciplines. Bien is from Brookings, South Dakota, and is a biology major. 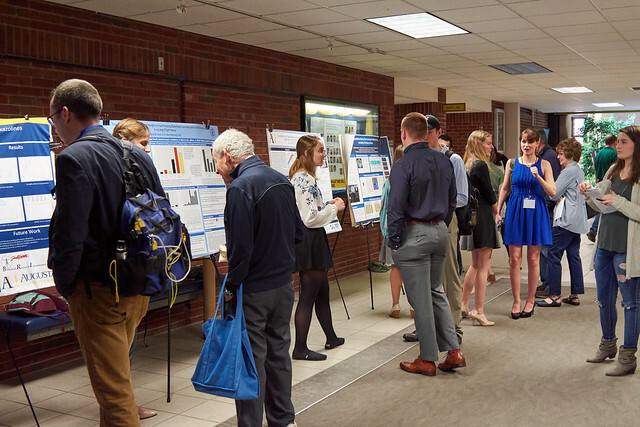 The Board of Trustees award was given to Charlie Iversrud ‘19 for his work entitled “Water Quality Analysis of Lake Petén Itzá, Guatemala and Exploring Threat of a Major Fish Kill Should This Deep Tropical Lake Experience Turnover.” Iversrud was selected for doing research that lifts up the Augustana core value of Service. Iversrud is from Bloomington, Minnesota. He is a Spanish and biology major. The President’s Cabinet award was given Samson Mettler ‘19 for his research entitled “Persistent Transphobia in the Theatre: How 'Safe Spaces' Unintentionally Uphold Systemic Discrimination.” Mettler’s work was honored for both emphasizing and demonstrating the importance of the value of community. Mettler’s research highlights the core values of Excellence and Community. Mettler is from Sioux Falls. He is an interdisciplinary major, combining psychology, theatre, and special education.